Making an impression at a tradeshow requires some swagger. You should be visually engaging without seeming like you're trying too hard or begging for attention. Your primary goals should be 1) showcasing your product or service and 2) communicating your company values. Once consumers know who you are and what you stand for, they'll engage with you at a deeper level. That's why your tradeshow booth needs something extra special to stand out—like a sweet custom tablecloth or logo runner. Custom linens like these are easy to create, and it's something so visually unique that it's going to spark your booth visitors' curiosity. Here are seven ideas for how to create and use a custom logo tablecloth or runner at your next tradeshow. 1. Create some contrast with your trade show attire. Your tradeshow booth should reflect your people so that you won't blend in with your background. 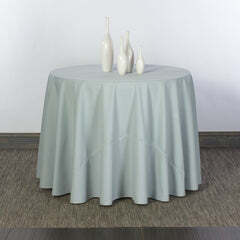 We recommend a custom logo tablecloth in a dual color scheme. For instance, if your team is wearing black polo shirts with a light blue logo and typography, then perhaps a light blue custom tablecloth with a black logo would accentuate that wardrobe choice. It's on-brand and a majorly bold design. 2. Include a clever or humorous tagline. Your catering or event planning business should use these custom linens as a way to showcase your personality. A clever or humorous tagline plastered on the front of your tradeshow booth on a crisp, clean and colorful new tablecloth is sure to turn a few heads. Naturally, not every hospitality business can afford a large tradeshow space. But what space you can afford should be used to its fullest potential. Those other booths might be cool with a standard 90 in. x 156 in. 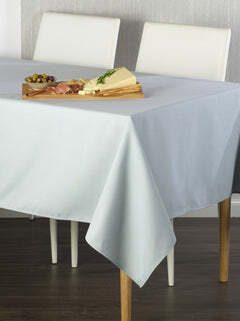 rectangular tablecloth. But you can do better. A couple of 30 in. x 96 in. x 30 in. box tablecloths with custom graphics that spell out your name when placed next to each other—now that's bold. You'll use up the same floor space but do so in a much more interesting way. We recommend a poplin fabric. It’s the industry go-to for corporate cloths due to its light weight, high durability, wrinkle resistance, reusability and affordability. 4. Give away some matching swag. That sweet design scheme, that clever tagline, that new menu launch concept—your custom tablecloth should highlight these things whenever possible. Your goal for any tradeshow is to leave a branded impression that leaves attendees wanting more. How about giving away some matching t-shirts, pens or plastic mugs as free swag? They're relatively low-cost marketing collateral that reinforces your brand long after the show's over. 5. Make it a social tablecloth! A social tablecloth? That's right. Invite your booth guests to sign it and share the experience via their social media like Instagram or Twitter. This will actually make your tradeshow booth a real social conversation-starter. Guests walking by will be curious as to why your table is full of signatures. Guests in the social-verse will be engaged by the level of personal interaction your booth commands. You can even use it to boost sales by offering a coupon reward to signees. 6. Match it up to your marketing collateral. With all the marketing collateral you'll be bringing to your tradeshow, you're going to want to ensure your tablecloth, runner and overall booth design are on-brand and consistently looking cool. For instance, you'll obviously be bringing plenty of business cards. You can design your custom tablecloth or runner to match your business card design in a thoughtful way with the same typography, logos, watermarks and trim. Those postcards and social brochures? Incorporate their same design elements (logos, typography, links, etc.) into your custom tablecloth and make it big enough for anyone on the tradeshow floor to see from a distance. 7. Invite guests to relax in some tradeshow furniture. Chances are that some of your tradeshow booth visitors will have been on their feet for a little while once they get around to you. Some of them might just be waiting to get back to their hotel rooms and relax. But why should they have to wait to do so? Surround your booth with some comfy chairs decorated in custom cushions or pillows to match that logo runner! Not only is it a refreshingly unique way to display your brand presence, but it will also ensure that your guests will stick around your tradeshow booth for a little while and converse with your team members. Whether you're a caterer looking for personalized linens for your next wedding event or a hotel owner trying to achieve that certain sophistication, custom logo tablecloths and runners are like a coat of arms when you're out on the tradeshow floor. They're a big, bold announcement to other tradeshow attendees of who you are in the hospitality industry. There is a ton of value to creating custom linens for your tradeshow booth or open house event. Finding it just requires a little imagination. Go online to start doodling or give us a call at 1.888.503.6635 if you're ready to create a custom logo tablecloth or runner for your next tradeshow or event. If you need a single centered logo or a specific placement for your logo, email us at support@doodlendesigns.com and we’ll send you a photo version along with instructions how to proceed with your order. Time to give your tradeshow booth that wow factor.